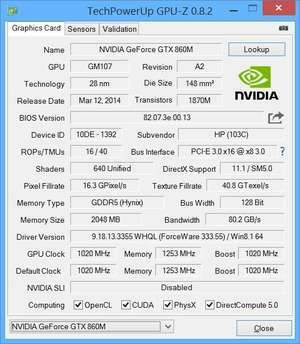 GPU-Z is a small graphics card utility that collects and presents information about the graphics card, the temperature, memory and more. The program sports an easy-to-use graphical user interface which organizes its different features in to the following tabs: Graphics Card, Sensors and Validation. The Graphics Card tab of the GPU-Z interface provides all of the relevant details about the installed graphics processor including the technology, die size, release date, shaders, memory and memory type. Other details include driver version and GPU clock speed. Version 2.18.0 is a freeware program which does not have restrictions and it's free so it doesn't cost anything. For security reasons, you should also check out the GPU-Z download at LO4D.com which includes virus and malware tests. Additional screenshots of this application download may be available, too.